At Christmas I love sitting down with the family and watching festive films. I love to sit cuddled under a blanket, with a bag of popcorn and the lights dimmed down. 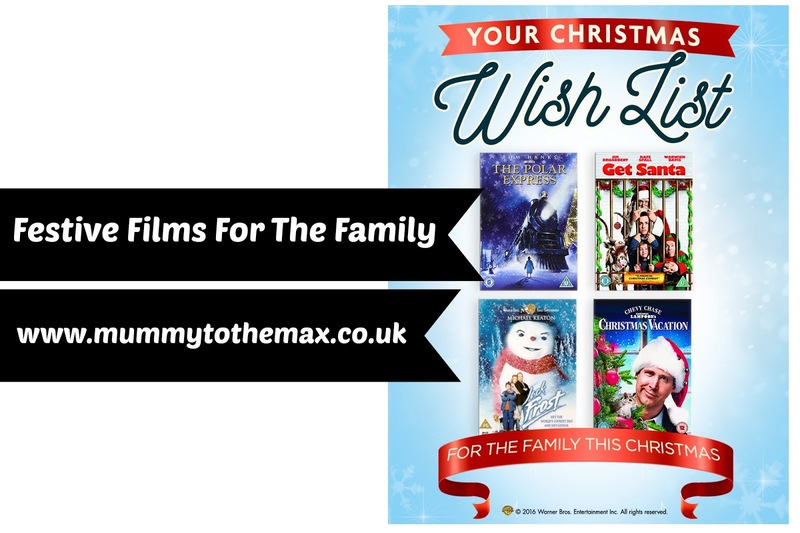 Watching films as a family at Christmas has started to become a tradition in my house so this year we have been looking for some festive favourites to watch. This year Warner Bros have a fantastic selection of Christmas classics for us to enjoy. When I think of Christmas films, I think of the Polar Express. The Polar Express is a massive favourite for many families are the globe and it is a film which we love as a family. If you are not familiar with The Polar Express, The Polar Express is about a boy who lies in bed hoping to hear the sound of reindeer bells from Santa's sleigh. When to his surprise, a steam engine's roar and whistle can be heard outside his window. The conductor invites him on board to take an extraordinary journey to the North Pole. Get Santa is a film which we watched last year and as a family, we enjoyed watching it. Get Santa is a festive comedy which is quite funny. Get Santa is about a nine-year-old little boy who discovers that Santa Claus has crashed his sleigh into his parent's garden shed. The little boy tries to get his dad to help him get Santa home to Lapland in time for Christmas. However there are problems and obstacles getting in the way of Santa getting home. National Lampoon's Christmas Vacation is a film which I remember from my childhood. National Lampoon's Christmas Vacation is a old film but it is a firm family favourite in many households. National Lampoon's Christmas Vacation is the third instalment of the National Lampoons movie saga. The film is about a disaster-prone dad who discovers just how dangerous the Christmas season really is as the Griswolds' old-fashioned holiday celebration turns out to be more "Bah! Humbug!" than Christmas cheer. There are a lot of funny moments in this film which will make the whole family chuckle. Aspiring rock singer Jack Frost has been struggling for years to make it big, often missing out on precious time with his family on the way. While driving to a music mogul's party one wintry evening, Jack realizes that his family is more important than his career, and turns his car around - only to plunge to his death when he swerves off the road in a blizzard! One year on, an angry and depressed Charlie is still mourning for his father. With an amazing happy ending, Jack comes back to life as a snowman.